What can I say? The little guy takes after his dad! I've been so excited about working on this stuff that I actually went ahead and joined an embroidery swap! (For those of you who read my blog, that's really no surprise, is it?? : ) Yes, it seems that the bug has bitten. 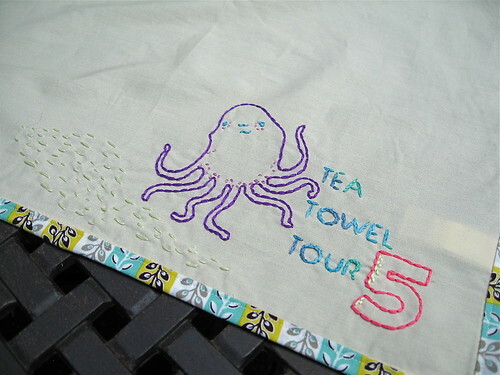 It's called the Tea Towel Tour and it's hosted over on Craftster. I first learned about this swap from my crafty pal Rita, and I was excited to hear that another round was opening up. The premise is simple ... everyone in the swap is placed into groups of 6. A small towel (or napkin, or apron, or pillowcase, or whatever) travels from swapper to swapper, collecting a small embroidered design at each stop along the way. Here's my piece. I started it with a small picture of an octopus, and then bound it with one of my favorite Flea Market Fancy prints. The cloth napkin is a really soft sage green and the pattern is by Andrea Zuill, who writes the awesome Badbird blog. I've asked my fellow swappers to stick to an oceanic / underwater theme. I'm so excited to see what they come up with! If you want to follow along with the action or check out the work from the prior tours, visit us in the Flickr group. Wait! What's that? It looks like I accidentally added 2 of the "Doodle Stitching" books to my cart! Rather than sending it back to Amazon, I took it as a sign that it was time for a giveaway. So, if you are a quilter that's been itching to try your hand at embroidery (like I was) and think this great book would give you the inspiration you need to get started, leave me a comment and you'll be entered to win! Just tell me how you'd like to use your new embroidery skills, or what kind of project you think you'd like to make. I'll even throw some extra goodies in with the book. I'll pick a winner (via the Random Number Generator) on Thursday, September 3rd. Good luck, and spread the word!! Found you through MBS. Did you happen to see the tea towels in the latest post over there? Very cute. Keep up the creativity. How cool is that? I was just checking out some embroidery links and thought I'd like to give that a try. I'm impresed with your first try. It turned out pretty good. Please enter my name in the draw. BTW...congrats on the Moda Tutorial. It's another one to add to my list of things to make. I have actually been looking into embroidery books to make some cute baby quilts with fun embroidery on them. I would also like to be able to embroider t-shirts, I think that would be really great. I'd love to embroider names on quilts with a little design, maybe. Love your tutorial - I bought fabric today to make it. Congrats! I'm loving your embroidery - what a great new skill! I'd love to learn to embroider so that I can add little bits of interest to my quilting! am itching to incorporate embroidery into my quilts by embroidering abc blocks and making a child's quilt. Oh, I've been eyeing that book...I'm intrigued by the doodle stitching and would love to add a little to my quilts. That book would motivate me to actually try it. Enjoy your blog, what a great giveaway. This is on of the books I just keep checking out of the library over and over! The frogs are so cute. 2 years ago I coached my 4 year olds team. What a work-out! Sometimes I would carry 2 crying girls and run with the ball. I have been wanting to try some stitches. I have a little tiny bit. The little deer is beautiful. I have been wanting to come up with a deer quilt for my 13 year old and there not alot. Might be an idea for an alternate block with plaids. Cute octopus! I was just looking at that book with my sister but we didn't buy it, yet! We took a class from Sue Spargo so now we are inspired to learn more embroidery to work into our sewing projects. I would love to take my kids drawings and embroider them on fabric to create a quilt or some kind of keepsake. Pick me, pick me. I'll cross my fingers and toes, this looks awesome! Love your work. ;) PS: If I win, I'll pay postage to OZ. It has been fun to see the different stitching doodles you have been doing lately. Makes me want to try my hand at it. I think I would start with something small and make a little coin purse out of it. That guarantees a finished product! oooo how I would love to win! I just love the quilts that incorporate embroidery into the blocks, so that's what I would do if I start embroidering - (it's bound to happen eventually). I think a baby quilt with embroidery would just be delightful. Thanks for the giveaway, that book looks fab! Wow, you are so talented. I've been thinking lately that I need to learn to embroider - cloth napkins, images on quilts...aren't the posibilities endless??? Sorry to hear about the Frogs.. They'll get 'em next time. Or have fun trying right? If your lil' bugger takes after you, does that mean he'll be a quilter too? Embroidery...hmmm my grandmother does a tin of embroidery, I think I'll try my hand at it. If I would just happen to win your nifty give away that would give me the boost I need to get started! You're the best Quilt Dad EVER! I've got a lot of old clothes around that I've been meaning to refashion in some day for quite some time, and I think some quirky embroidery could motivate me/give them a nice facelift. Hi! I just found your blog and saw the giveaway! I have been embroidery some onesies for new babies in my family and the doodle book looks like it would have some great design ideas in it! Love the octopus! I just started following your blog after I saw your pattern on Moda Bake Shop. I've always thought it would be a great idea to add embroidery to some blocks to give a quilt a new dimention. Flowers would be really pretty. You've done a great job on your first attempts. How nice that you bought two books :) so you can give one away. I follow your blog and find it very fun and full of inspiration! Good luck with your tea towels,a great idea. Tell your kids not to worry about scoring a goal. I remember when our youngest was playing netball,they were the newest youngest team and never one a game. We had a party when they scored there first goal. They did go on to play well. I would love to take the extra book of your hands it looks real interesting. Have a happy day. What a cute little octopus! I used to do crewel embroidery, but that's been over 20 years ago and I really haven't seen anything I wanted to put that much time into. These designs however, look quick and cute, and I could see a couple of these in my future. So yeah, I'd like to win! Hmm. Hankercheifs or a set of pillowcases to start maybe? No worries, Frogs, my ladies team lost 7-1 tonight, but we still left the fields with a smile. Isn't soccer the best way to spend an hour? Embroidery looks like something I could do on those long rides to the soccer fields, so maybe I could use it in a tote bag......or a cute picnic blanket. How great is this! I just picked up a Crabapple Hill "Tws the Night Before Christmas" embroidery pattern. I don't know what came over me but I love it! So much for a little project LOL. Great Octopus and embroidery! Please enter me into your give-a-way! I would use embroidery to do some images on quilts of course. You are even worse than me about joining new swaps and starting new hobbies!! (I spent the weekend rehabbing an old telephone table - like I need a new hobby!!) I love the idea of stitch doodling - and have been inspired by the work on this blog: http://www.wardi.dk/craftyblog.html Would love to win the extra book so that I can start a new hobby! Hi John, my you do some wonderful stuff, congrats on the moda tutorial - well done! and now venturing into the nether world of embroidery too huh. I already incorporate stitching every chance I get, I am totally lost if I don't have some stitching on the go, it goes with me absolutely everywhere, watch out! Ohhh how exciting! I love your tea towel beginning...you will have to post the finish as well. I have been searching all over for embroidery ideas as well. I was thinking of making a name hoop piece for each of my kids to hang over their bed. I love the picture of your son, my youngest has been making the same face every time I point a camera his direction. What gives? I've done a bit of embroidery in the past but not all that much. I'd love to create custom pillow cases! I too have embroidery on the brain. 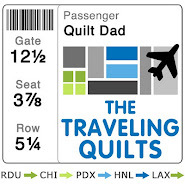 I want to try embroidered quilt labels and I've got a place mat idea in my head that won't let up. Thanks for the chance to win. I can't wait to get wonky! Your little froggies are darling! That craftster comes up with the neatest ideas. Love to embroider. Haven't done it in ages. Maybe a sampler would be fun! Cute little froggies, and brother tad pole! I have had my eye on that book, too. I like to see some modern embroidery! I have dabbled in the past, but I could only find patterns that weren't really my style. Great giveaway! I love the tea towel...how cute is that? Have you looked at Checkout Girl's blog? She does some super cute stuff with wool felt and embroidery stitches. Hello! Always great to find a new blog. I've started doing "stitchery" because the Australian quilt designer use it in their patterns. It would be great to win your book and have some fun. Thanks looking forward to reading your blog. Thanks for the giveaway! I've really been enjoying hand-sewing month at Sew, Mama, Sew. I'd love to try the embroidery patterns that Sarah Jane contributed. I think I would use the embroidery on something cute for my almost 3 year old niece. Well that would be my starting place. From there....who knows. Doodle Stitching is a fantastic book. My sister-in-law gave it to my daughter and I would love my own copy. I'd love to try the lampshades....that book has so many ideas it just makes your head spin! i'm not itching to try embroidery-- i already do quite a lot. does that disqualify me? i'm interested in learning more about doodle stitching. I love the little elephant! I really like the embroidery used as the center of blocks in quilts. So if I won, that is what I would use the embroidery book to help me do. Thanks for the great giveaway and website. A few weeks ago, I found a baby quilt in GOODWILL that is 12 hand embroidered patches, different animals on white. I love love love it, and got it for a steal ($2)! Ever since though, I find myself poring over hand embroidery tutorials, and have even bought a small kit from the clearance section at Joanns. Sadly, that is as far as I have gotten with it. Oooh I would love to add that book to my library. The little elephant looks great! Oh wow! How generous John! Well I won't say no! I've been really wanting to learn more about stitchin' so that I can do some wall hangings for the kiddos rooms--this might be the start I need! What a great blog. I found your blog through Moda Bake Shop. So glad I did. I'm adding you to my favorites and will visit often. Oh man, what a great giveaway! After you mentioned embroidery in your last post, I've been wanting to give it a try and I have that book on my to-buy list! I want to use embroidery in some mini quilts for my apartment. Oh, I hope I'll be the lucky one! I've been itching to embroider some dish towels and handkerchiefs, and a book full of designs would be perfect right about now! I too would embroider designs on quilts. After all they are my favorite things to sew. :) Love your site. I also found you through MBS. Great tutorial. Sign me up! I've been wanting to make some fancy guest towels with some embroidery. Not that I am fancy or that I have many guests but it's something fun to have to give as gifts. Thanks for the chance! I've been looking at that book! I haven't embroidered since I was about 10...and seeing it recently on quilts has made me wanna try again! Hi John, I'm thinking of making a baby quilt with some embroidery. Sorry about the loss. The important question is - did they have fun? The look like they did! Great job John! Your doing really well with that embroidery! And oh what a shame about that extra book! I'm just glad we're all here to help you out in taking it off your hands! hehe! 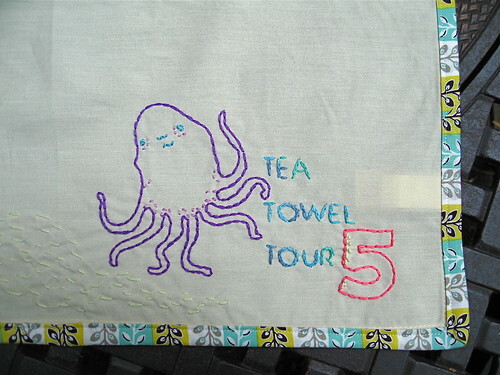 That Tea Towel Tour looks really fun! Good luck! i just discovered your blog, and i love it! i'm interested in trying some embroidering, perhaps on a baby quilt or shirts for my boys (3 and 7 months). Your embroidery is gorgeous, as is everything I've seen you do here. Keep it up! Sorry about the frogs -- but I bet they had fun -- and that is the most important thing! I'd love to make some tea towels and use embroidery to embellish quilts/quilt labels. We're expecting our second child next spring and I'd love to embroider some onesies, clothes, and blankets for new little one and for big brother too! I've been downloading some embroidery BOM from different websites - but haven't been able to get started...I think I NEED this book to help me jump in! Thanks for entering me into the giveaway. I think I'd want to try and design a logo, symbol or secret "something" to add to each of my quilts as the finishing touch. I've never seen that book before, it looks really neat, not like the typical traditional floral stitchery! I have avoided embroidery (even though the projects presented on Hugs From Helen's blogs have included alot of it). . .for the past two years. However, with all the interest that has been generated I have been thinking about trying it. Should I win your giveaway it would be the final "push" I need, I think. he he he he (Like I really need to be "pushed" to try something new! HAH! Looks like the embroidery bug has really bitten!! Its bit nipping at me. What nice giveaway. Thanks!! Totally forgot to tell you what I would work on. I would like to add some to my quilts. Also I make my kids clothes and doll clothes and would love to put a little embroidery on it. I would love to make pillowcases for each of my 7 kids...and tea towels for friends. I think embroidery is just so dreamy. My daughter and I are actually just starting on Lynnette Anderson's Noah's Ark project. We are both beginners but it's going to be a fun mother/daughter project. Wow! Very generous giveaway. I've been wanting to try any form of handwork lately especially to incorporate in quilting. Looking forward to following along (although not participating) in the wonky quilt along! I would like to improve my embroidery skills so that I can incorporate them into my quilting. I so want to make awesome arty, story-telling quilts like Faith Ringgold...she is an inspiration to me! I have been wanting to check out this book for some time. It looks like it full of great ideas. Great job on the elephant. nifty giveaway! i love embroidery and would like to brush up on my "skills" since it has always run in the family, but i wasn't taught... i'd use it on dresses and skirts, add some cute touches to kid's clothes and put a little into some of my quilts. nice job on the octopus too. it's lovely! ohh..that book is in my amazon wishlist!What a fun swap cant wait to see the finished towel! i like to embroider onto baby bibs i make as gifts but i've only actually learned the proper way once and that was 15 years ago. would be great to learn the 'right' way again and not just make it up. I would LOVE to have this book! I have already started working on some Christmas gifts and I have plans to embroider some towels and pillows and other things to give this year. And being unemployed, I've been drooling over this book and others but not able to spend the money to buy them. Thanks for the giveaway! And I LOVE the elephant you're doing! I would love to try it. I have always wanted to add a few embrodiery blocks to a quilt. So having a book to help would be awesome! I love the elephant and octopus. Look forward to seeing more! What a great give away. And I love your embroidery - it looks great! I have been doing embroidery for a few years but would love to win the book as it looks like it has some really cute things. Thanks for the chance to win. I love your elephant and octopus! I think the idea of adding embroidery to your quilt labels is a very good one. I would also like to make personalized embroidered Christmas ornaments. Sorry, about the frogs. Luckily, at that age it's all about fun and not winning and losing:) I'd love to try the embroidery thing. I'd want to incorparate it into my quilting. I'd use the book to whip up a pile of baby and wedding gifts - so I had a stack ready for those "surprise" gift giving moments! Oh, and embellish a few quilts. p.s.-- I love your blog. I get a little giddy everytime I see you've posted something new. I tried to teach myself a few months back and LOVE the peaceful feeling I find when it's just me and a needle getting something done! found you from Moda Bake Shop. I have done a whole bunch of different crafts, and I just LOVE quilting, I have been thinking that this is the next 'thing' I want to try out, and I would LOVE to get that book!!! My mom and I like to do sewing projects together and on the latest one we are adding embroidery. She is going to teach me since I have never done it. She has actually been eyeing this book for a while and would be great to give to her as a thanks for teaching me! I am dying to try out some embroidery! I'd love to make a tea towel or two for Christmas presents! I have done some embroidery as a kid nothing fancy. But it would definitely be fun to combine it with my new love of quilting and make some blocks for a quilt. Ooh what a fun giveaway. I would LOVE to take on a new craft addiction! I wish I could get my husband to read your blog. It would certainly change his mind about quilting! I have been itching to do some embroidery but I'm waiting for fall. It seems like such a good way to pass those darker, cooler nights. Toss my name in the sewing basket, please. I would love to win this book! I think it would have some good ideas for my russian punch needle designs. Thanks for the opportunity! I have to admit that I have done some embroidery and really love it! So I'm not new to the scene but I think this book looks like fun. Your towels look great! Thanks for the chance to win. I love embroidery but only know 1 stich...would love to read more about it!! I've been wanting to try my hand at embroidering an article of clothing, like at the hem of a skirt maybe! It's a great sport! Do they play with teams of 7 or 11 players? And.....ooooohhh...I would love to win your giveaway! I would love to embellish the clothes and the bags I make for my children with some embroidery! I am so excited for you with the tea towel tour! Is Rita along for the ride with you? I do not have time to try it this time, but sometime in the future.... I have to keep saying, "no more swaps, no more swaps until after the baby" over and over so I don't get in over my head. Your new books look delightful! Your daughters are darling - so without scores is so fun. I have always wanted to try some embroidery maybe this will get me motivated. I would love to try my hand at embroidery so that I can add to my quilts with embroidered quilt squares and use it for labeling my quilts. Nice work on your embroidery! I love that you've joined a swap, that is just too perfect. A great way to practice a new skill, of course. And the aquatic theme is adorable. I do love embroidery. I do so need to embroider every day. Turkey Feathers has some great patterns. Thank You for the chance to win! What a great blog you have. I found you through Moda Bake Shop. I actually learned how to embroider when I was a kid, many years ago. Switched to quilting about 25 years ago, and haven't stopped yet. I do love embroidery and would like to get back to it. The books look like they'd be fun to try. Greetings from Seattle. 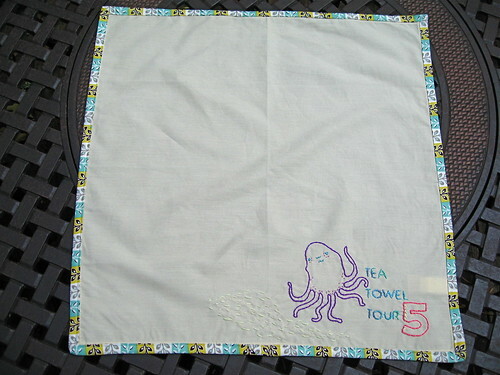 The Tea Towel Tour looks like fun - your ocean theme towel is sooo cute! I'm looking to make up some burp cloths for a friend who is having a little boy in the next few weeks -- it would be so cute to add some embroidery to it! Would love to win the book for some ideas -- thanks for the great giveaway! I have started to sew quite a bit and can't wait to finish my first quilt. I thought it would be cute to make a block quilt with a stitched design in each block! I also love the tea towel idea...so inspiring! Now is the time to try embroidering; it's September so it's a great time to learn something new!! Good Luck! Love your work! I thought a block quilt with a stitched design in each block would be fun! I also love the tea towel idea. I've been dabbling in embroidery as well. I've got some cute little blocks I started that I'll be sending out to all the gals in one of my quilting bees. I would love to learn some new techniques! Thanks so much for such a great giveaway. I really want to do some of those fantastic tea towels. Here's to hoping I win! I used to embroider a bit when I was younger and was just thinking I should make a quilt with embroidery, similiar to one my Grandmother made. Would LOVE to win this! Thanks for the chance! I started embroidering last year and love it. I actually found you through Amiee Ray's blog. I love all your quilting projects. I've been wanting to try but have felt way to intimidated by it. Maybe I can try making one of those cute drawstring bags. Im nervous just thinking about it. Oh my next embroidery project is making a robot shirt for my son. Im so glad I found your blog. I would love to learn how to make some of the projects from doodle stitching- the baby quilt is definitely great and I would love to make it, and have that as a giveaway on my blog! I really want to do more stitching but I'm running out of family to pass it on to so I think giveaways would be the perfect idea along with donations to children's centers. What a cute swap idea! I'm starting to get curious about embroidery from Sew Mama Sew last month. This book would be great! Nice job at MBS. Keep it up! I would love to embroider my daughters clothes as well as bags. I am new to quilting and embroidery but I am loving it! i have just started getting interested in embroidery. i'm hoping to make some embroidered reusable shopping bags for christmas gifts, and this book would be just the trick! I have had my eye on that book! I love embroidery because it is so portlable and I can do it in the car while we go on longer car rides and it keeps me from harping at my poor husband about his driving. My kids love to do it too and the holidays are coming up so there are gifts to be made! I love the tea towel swap. I can't wait to see yours when it is done. what a great swap idea! An embroidered round robin. I've been eyeing up that book so I suppose I should join your giveaway though in the interests of honesty I should say I'm not a complete beginner on the embroidery front but I do like that style and have never really done it, mine has been more blackwork and such. It's funny, I've only recently become interested in trying embroidery again, after some sad results but fun attempts when I was about 7 years old. This would be great! I would love that book! I began embroidering about two weeks ago - so far nothing fancy, But I would like to make a skirt and add embroidery detail. Thanks for the chance to win! I bought an embroidery pattern of 4 trees/one for each season even tho I don't know how to embroider yet. I am hoping to learn by doing?? I DO NOT SPEAK ENGLISH BUT I LIKE YOUR PATCHWORK'S WORKS. I've been having "Christmas in June/July/August"...I've been busy embroidering tea towels to give as Christmas presents this year. It's addicting! Yours is great! Oh, I'd love to win that book. I did a bit of embroidery when I was a little kid, but not in years. I've just been thinking lately that it would make a nice addition to some of the quilts I'm making. And I love the work on the cover of the book. Thanks for the giveaway! Fun! I already embroider.....well, I used to, I haven't done anything in about 4 years, but I always like to refresh, check out new techniques and get fresh ideas! I would love to start embroidering all my quilt labels. This might be just the thing to get me to commit! Count me in on the giveaway! And a big congrats on the mbs tutorial!! How serendipitous! I've been researching scribble quilting and didn't even think about scribble embroidery. What do ya know. I would love to update my embroidery skills with this book. Stitched blocks in quilts is a neat trend on the rise. Thanks for being so generous John. Oh my! I've been eyeing that book for months! I've been wanting to add some embroidery stitching to my quilts. I'd love to do some twirly vines/flowers in the borders. Thanks for the opportunity. Looking forward to the wonky log cabin quilt-a-long too. Thanks! I just recently found your blog and love your work! I have been wanting to try some embroidery and the books looks really interesting. Thanks for the giveaway!! Id love to add some embroidery to my quilts...love what ive seen on your blog. thanks for the chance at this book. apron. I'm on a mad apron kick this month. WOuld love the books. Kind of an updated version of the embroidery my grandmother used to do. oH WHAT A great fun giveaway! Darn, logged under the wrong acct. :) that's me above...PumpkinCountry. I love doing embroidery and counted cross stitch. I would love to win the book! I can't wait to see what you do with the elephant! Feel free to rule me out on account of international postage, but I thought I would drop in to let you know that I discovered you recently both through searching Flickr Doll Quilts and Moda Bake Shop. Love your blog. I have just started rediscovering embroidery and I love it. I'm only doing the stem stitch and some french knots but I want to expand. Here's me keeping my fingers crossed! Love the octopus tea towel! This would be a perfect gift for my mum! I used to embroider and cross stitch all the time, I think I'd like to get back into the stitching part again. Thanks for the chance, John! I want one!!! if for no other reason thant o emboider that deer onto everything my 2 year old wears!!! I'm about to start your quilt along I think. if I can choose my fabrics that is. I have been DYING to embroidery. My Mother-in-law has a huge collection of antique embroidered pillow cases. I love the way they look all layered on the bed, so I would like to be able to make my very own embroidered pillow cases. I would love to start embroidering things -- especially pillows. I've always been attracted to the look of embroidery, and this book would be a perfect way to finally dip my toes in the water! oh my--way too cute. throw my number in the hat. 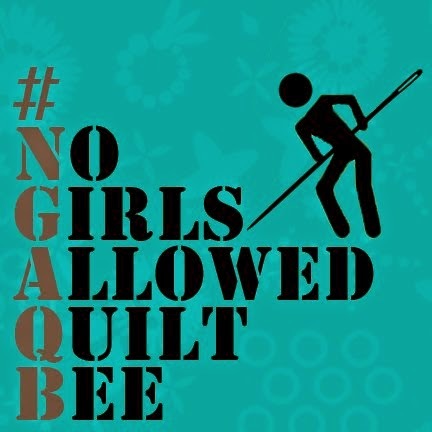 love ur quiltalong, too. i was in the oldredbarnquiltalong and finished the top, just haven't quilted it yet! Just been quilting a little over a year, and I've never tried my had at embroidery. If I won the book I'd use my new skill to make my crib-sized quilts even cuter! Thanks to the ladies over at SewMamaSew, I've been trying out all sorts of hand sewing skills. And embroidery is by far my new favorite. I'm working on a quilt for my DD, as she is graduating to the big bed very soon, and it definitely deserves some extra cuteness. Oh, it says "for beginners," that would be me! I would like to learn it to make cards and maybe incorporate on scrapbook pages. And maybe when I finally finish an entire quilt, I'd like to have my own little logo pic that I make with my own hand, not my machine. Hello! I just found my way over to your blog. Lovely stuff! I've never tried embroidery, but have always been VERY interested! I want to learn to embroider patterns onto my quilts! embroidery is something I think I could do. quilts. Thanks for the chance to win. OOOOHH! I would live to ahve a coyp of of the Doodle Stitching book! I took it out of the library, but I haven't bought it yet. Lots of inspiration. Thank you for the giveaway! I will make a wall qilt. I'd like to try embroidery on a quilt block...I've seen some great ideas. Thanks for the giveaway. I love embroidery! It is such a fun way to add something special to all kinds of things. Love the tea towel! Please enter my name in your giveaway! I've been noticing more embroidery incorporated in with quilting and I was thinkin' of giving it a try. I love embroidery! It is such fun and you can do so much with it. Like anything... practice, practice, practice, lol. I actually saw this book in Amazon and have it on my wishlist. I would love to doodlestitch. Probably on a teatowel for now, maybe quilt blocks too? I love your colors. i've never embroidered, but heard this is the best book... I'd love to have it! (By the way, I found you through Park City Girl). I've been debating trying my hand at embroidery for a while now - I'm just addicted to anything needlecraft-related. I'm definitely throwing my hat in the ring for this one! I would like to "doodle" some stitchery as part of my quilts, probably the label, possibly more if it looks good! Also a bit doodling on white dish cloths! Thanks for the giveaway! I hope I'm not too late. The book looks fun! oh dear... i wonder if you've chosen yet? Your work is beautiful. I decided to learn embroidery when I was a young girl and found many hours of pleasure in it. I was an only child and it was a wonderful way to entertain myself and create fun things at the same time. I have noticed that it seems to be making a major "comeback." I'm tempted to look into joining a group myself. You make it look fun and it would be exciting to work with others on a project. Also wanted to say "great job" on your Moda Bake shop project. Loved your colors. John, I love the fact that you added binding to your tea towels but wondered on the backside did you actually hand sew the binding down (seems like alot of work for tea towels) or did you sew it also by machine?